An upstanding member of society harbors a disquieting secret life as a serial killer. Earl Brooks is a man about Portland, Oregon with everything one could aspire to have: a successful business career, a sterling reputation as a philanthropist, and a healthy family life. 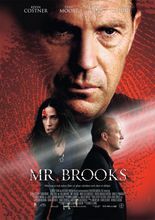 Beneath Earl's shining facade, however, sits a terrifying secret: a double life as "Marshall", a chaos-savoring murderer performing killings as the "Thumbprint Killer" whose fetish for death slowly begins to overtake his entire life despite an attempt to move past his "addiction".